The upright imaging method described in this protocol allows for the detailed visualization of the poles of a developing Drosophila melanogaster egg. This end-on view provides a new perspective into the arrangements and morphologies of multiple cell types in the follicular epithelium. Manning, L., Starz-Gaiano, M. Upright Imaging of Drosophila Egg Chambers. J. Vis. Exp. (97), e52636, doi:10.3791/52636 (2015). Drosophila melanogaster oogenesis provides an ideal context for studying varied developmental processes since the ovary is relatively simple in architecture, is well-characterized, and is amenable to genetic analysis. Each egg chamber consists of germ-line cells surrounded by a single epithelial layer of somatic follicle cells. Subsets of follicle cells undergo differentiation during specific stages to become several different cell types. Standard techniques primarily allow for a lateral view of egg chambers, and therefore a limited view of follicle cell organization and identity. The upright imaging protocol describes a mounting technique that enables a novel, vertical view of egg chambers with a standard confocal microscope. Samples are first mounted between two layers of glycerin jelly in a lateral (horizontal) position on a glass microscope slide. The jelly with encased egg chambers is then cut into blocks, transferred to a coverslip, and flipped to position egg chambers upright. Mounted egg chambers can be imaged on either an upright or an inverted confocal microscope. This technique enables the study of follicle cell specification, organization, molecular markers, and egg development with new detail and from a new perspective. Study of Drosophila melanogaster has provided great insights into the genetic regulation of a wide range of phenomena. In particular, there has been extensive research on egg development, because oogenesis provides a tractable way to investigate many different developmental processes, including tissue patterning, cell polarity changes, cell cycle switching, and translational regulation1,2,3,4. One important morphogenic event during oogenesis is the specification, acquisition of motility, and migration of a set of cells called border cells (reviewed in 5). Since cell migration is a key feature of animal morphogenesis, and because the genetic regulation of this process is well-conserved, mechanisms determined in flies are likely to be important in other contexts. Thus, we are investigating the molecular control of border cell migration. For our studies, we have developed a new method to observe the anterior poles of developing eggs, where border cells arise, to examine how they develop in detail. Within the ovary, egg chambers at various developmental stages exist along chains called ovarioles, which are encased in a thin sheath (Figure 1A). Each egg chamber will go on to form one egg. During oogenesis, several different cell types must develop in a coordinated manner. The D. melanogaster egg chamber consists of 16 germ-line cells, including one oocyte, surrounded by a single-layer follicular epithelium6. A small number of specialized cells, called polar cells, arise at the anterior and posterior poles of the epithelium. The 6-8 border cells originate in the anterior epithelium of the egg chamber, induced by the polar cells5,7. In mid-oogenesis (stage 9), the border cells detach from their neighbors and migrate between the nurse cells to reach the oocyte at the posterior of the egg chamber5,7. This movement must be accomplished while the border cells remain in a cluster surrounding two non-motile polar cells, making this a type of collective cell migration. Successful migration of the border cell cluster ensures proper development of the micropyle of the egg shell, which is necessary for fertilization. The anterior polar cells instruct border cell fate by activating a signal transduction cascade. Polar cells secrete a cytokine, Unpaired (UPD), which binds to a transmembrane receptor, Domeless (DOME), on neighboring follicle cells during stage 8 of oocyte development8,9. The binding of UPD causes Janus tyrosine kinase (JAK) to phosphorylate the Signal Transducer and Activator of Transcription (STAT)8,10,11. STAT then moves to the nucleus to activate transcription. Slow Border Cells (SLBO) is a transcription factor that is a direct transcriptional target of STAT and is also required for border cell migration12. Lateral views of egg chambers indicate that STAT activity is regulated in a gradient across the anterior epithelium8,11,13. Follicle cells closest to the polar cells have the highest levels of activated STAT, thus they become border cells and invade the adjacent germ-line tissue. To understand how the border cells are specified within and detach from the epithelium, we need to observe how the tissue is organized. If we view egg chambers from an anterior-on perspective, we would expect radial symmetry of STAT activity in the follicle cells surrounding the polar cells. An end-on view would also more accurately show differences of membrane proteins and cell-cell interfaces prior to and during detachment than comparing cells in different focal planes. Because egg chambers are oblong and attached to each other by stalk cells, they settle onto slides laterally, making it difficult to observe the anterior architecture. Thus, much information about the cells at the poles of the egg chamber has been inferred from lateral views. Although some information can be obtained through algorithmic 3-D reconstructions of optical sections, light scattering, photobleaching, and poorer limits of resolution in the Z-axis make this information less detailed and reliable in the absence of expensive techniques like super-resolution microscopy14. Other kinds of section-based imaging (for example, electron microscopy or microtome sectioning) require extensive manipulation of tissues, including dehydration, increasing the likelihood for artifacts. Thus, we developed a new method to image D. melanogaster egg chambers while upright. This method has already proven useful in elucidating how motile cells are fated (see Representative results and Manning et al, under review), and is likely to be more broadly valuable in studies of other aspects of oogenesis. Transfer about fifteen 2-4-day-old female flies and a few males to a fresh fly food vial with added active dry yeast. Use cotton as a plug for the vials, and add a few drops of water to the cotton to keep the humidity high. Place vial in a 25 °C incubator for 14-16 hr to maximize the number of stage 8-10 egg chambers. NOTE: Incubation time varies depending on temperature and desired stage. Prepare dissection media, 0.1M KPO4 and NP40 solutions as needed for the next day (see Materials). Anesthetize the flies using CO2, and place under a dissection microscope. Pipet several drops of dissection media into each cavity in the glass depression slide. Hold forceps in each hand at an approximately 30° angle to the table top and orient one female fly with the wings down. With your non-dominant hand, pick up the female using forceps, grasping her at the anterior of the abdomen, near the thorax, and submerge her into the dissection media in the depression slide (Figure 1A inset). With the other pair of forceps, grasp the exoskeleton at the ventral posterior of the abdomen and pierce through. Grab the ovaries at the posterior end, then pull them out of the abdomen and place into the fresh media on the other side of the depression slide. (Figure 1A inset). Avoid pulling apart the gut. Discard the carcass. Repeat with the other female flies until all ovaries are dissected. Discard the males. With one pair of forceps, hold an ovary at the posterior end (near the largest egg chambers), and with the other hand use a pair of forceps to pinch one of the most anterior egg chambers (germarium). (Figure 1A). Slowly and steadily, pull an ovariole chain out of the ovary sheath. Continue to dissect out ovarioles individually until all desired egg chambers are removed. Repeat steps 1.7-1.8 for all dissected ovaries. Once complete, transfer ovarioles to a 0.6ml tube using a plastic transfer pipette. Let ovarioles settle to the bottom of tube, then proceed to fixing and staining steps. Carefully remove dissection media from ovarioles with a pipette. Be sure not to remove any ovarioles or egg chambers. Leave approximately 50 μl of ovarioles and dissection media. Add 50 μl of 16% paraformaldehyde to 150 μl of 0.1 M KPO4 Buffer in a tube, and add solution to egg chambers to fix them. Incubate while rocking for 10 min. CAUTION: paraformaldehyde is toxic. Remove fixative and rinse twice with 0.5 ml NP40 wash buffer. Wash two times for 15 min each at RT. Refer to standard IF protocol15 for subsequent steps. Briefly, after fixation, add primary antibodies at the appropriate dilutions and incubate O/N at 4 °C. Wash in NP40 several times, then add secondary antibodies (1:200 dilutions). Wash several times in NP40, then add DAPI (1:1,000) for 10 min, then repeat washes. Once IF protocol is complete, add 200 μl of 50% glycerol in PBS to egg chambers and let sit at RT for 2 hr. Remove solution, replace it with 70% glycerol in PBS, and cover with foil. Place sample at 4 ᵒC until ready for mounting. Meanwhile, continue with step 3. Measure at least 4 ml of glycerin jelly using a spatula and fill a glass cell culture tube to the half way mark. Melt glycerin jelly in a water bath at 55 °C for 30 min. Pour a small drop of glycerol, approximately 300 μl, from the stock solution onto two microscope slides. Using a tissue, spread glycerol in a thin layer across each of the slides. This provides a base and allows for easy removal of glycerin jelly at step 5.6. Cut the tip off of a filtered 1,000 μl pipette tip. Use cut pipette tip to transfer 1,000-1,500 μl of warm glycerin jelly slowly to each microscope slide. Take care to prevent bubbles. Let glycerin jelly slides sit for 5 min at RT to set. Place each glycerin jelly slide in 60 mm × 15 mm petri dish and cover with plastic wrap. Place at 4 °C O/N. Optionally, store glycerin jelly slides for up to 5 days at 4 °C. Using samples from step 2.5, pipette several 3 μl drops of egg chambers in 70% glycerol across one glycerin jelly slide. Continue pipetting 3 μl drops until all egg chambers are on this slide. Make sure each drop contains at least ten egg chambers. Meanwhile, heat a culture tube of glycerin jelly in a 55 °C water bath. Place the glycerin jelly slide with egg chambers under a dissection microscope. Adjust magnification so that only one drop of egg chambers is in the field of view (Figure 1B). Using a 30 gauge needle as a spoon, pick up the desired stage egg chamber. When necessary, separate desired egg chambers from an ovariole chain using the needle as a knife. To avoid debris that may interfere with imaging, transfer the egg chamber to the second glycerin jelly slide, with the anterior facing left (Figure 1E-1). Repeat until there are at least seven egg chambers lined up in a column (Figure 1C). Form new columns of seven until all desired egg chambers are transferred to the second glycerin jelly slide. Tear off a small piece of tissue and twist. Use this to absorb the excess PBS-Glycerol from the egg chambers by lightly touching each one. Take care to not remove egg chambers. Cut off the tip of a filtered 200 μl pipette tip. Use this to transfer 150 μl of glycerin jelly to cover all the columns of egg chambers. NOTE: The amount of glycerin jelly needed to cover the columns is based on egg chamber stages and number of columns. Amount may be adjusted. Let mounted egg chambers sit for 5 min at RT until the top layer of glycerin jelly is completely solidified (Figure 1D). Place slide of mounted egg chambers in a 60 mm × 15 mm petri dish and cover with plastic wrap. Store at 4 °C O/N to allow the glycerin jelly layers to solidify together (place in the dark if there is concern about photobleaching). Place slide of mounted egg chambers under a dissection microscope. Adjust magnification so that only one column of egg chambers is in the field of view. Next, cut above the first egg chamber at the top and below the last egg chamber in the column. At this point the column of egg chambers should be cut on three sides. Using a microknife, slice along the left side of the column, as close as possible to the anterior side of the egg chambers (Figure 1E-3). Pipette 100 μl of cold 1X PBT over the cut column. Use a round edged spatula to remove the excess glycerin jelly around three sides of the cut column of egg chambers and discard, leaving the rest on the slide. Insert the spatula in the cut made at the anterior side of egg chambers and separate the column from the primary glycerin jelly block. Prepare samples for either inverted (5.8.1) or upright (5.8.2) microscopy. For Inverted Microscope: Transfer the column of egg chambers to a coverslip with anterior side of egg chambers facing down. Repeat steps 5.2-5.8 until all columns of glycerin jelly have been removed and mounted. Add a couple of drops of 50% PBS-Glycerol onto each block of egg chambers to prevent them from drying out. Image egg chambers directly on coverslip. For Upright Microscope: Transfer the column of egg chambers to a microscope slide with the anterior side facing up. Repeat steps 5.2-5.9 until all columns of glycerin jelly have been removed and mounted on microscope slides. Add a couple of drops of 50% PBS-Glycerol onto each block of egg chambers and cover blocks with a #1 ½ coverslip. The upright imaging method allowed us to see directly the organization of cells in the anterior follicular epithelium at stage 8. A general marker for follicle cell fate, the Eyes Absent (EYA) protein, as well as the nuclear DNA marker DAPI, showed even expression across this field of cells, and demonstrated that all cells could be seen with similar staining intensities (Figure 2B”). Proteins regulated in response to the cytokine UPD, however, showed variable patterns and expression levels. Polar cells release UPD apically prior to this stage of egg development16,17, so we expected STAT to be activated radially about the polar cells, which was sometimes the case. Often, though, we observed that downstream targets of STAT, including SLBO, had more complex expression patterns. For example, GFP reporter for SLBO expression appeared in most, but not all, cells that surrounded the polar cells (Figure 2B, and see Manning et al under review). We noticed slight differences in E-cadherin expression/localization (Figure 2B’), which may reflect changes in adhesion, but more work will be needed to quantify and interpret this result. These subtleties were not detectable through lateral three-dimensional reconstruction of staged egg chambers (Figure 2C-D). The differences in the apical-basal axis of the follicle cells can also be distinguished using the upright method. We used a reporter line for the ring canal protein Visgun (VSG), which is present in the apical region of plasma membranes18 (Figure 3A). Upright imaging confirmed VSG expression was detected in the apical portion of the follicle cells, near the narrowest part of the polar cells (Figure 3B). We have also found that the upright imaging method works well to view the anterior epithelium in stage 9 egg chambers. At this developmental stage, the border cells coalesce together around the polar cells (Figure 4A). We could observe these compacted clusters using the end-on imaging (Figure 4B-C). As in stage 8, we found similar levels of EYA expression in all the epithelial cells (not shown), while slbo-GFP as well as activated, nuclear STAT marked the motile border cells (Figure 4B and 4C). Localization of FAS3 protein indicated the polar cell-polar cell interface (Figure 4B). In addition, in both stages 8 and 9 we could see the large nurse cells, as indicated by DAPI or phalloidin-staining of cortical actin (not shown), which suggests this method will also be useful in study of germ line cells or germ cell-follicle cell interactions. Figure 1. Upright mounting of Drosophila egg chambers. (A) Drosophila ovary indicating egg chamber, sheath, and ovariole. Depiction illustrates the position of forceps for pulling the ovariole slowly from the ovary sheath. Inset shows positioning of fly for dissection. Ventral side of female fly faces upward. A-anterior, P-posterior. (B-D) Procedure of mounting egg chambers. (B) A small drop of egg chambers in 70% glycerol-PBS, viewed under a dissection stereomicroscope. The yellow arrow indicates an ovariole chain; yellow arrowhead indicates an individual egg chamber. Red arrow indicates the edge of the Glycerol-PBS drop. (C) Columns of egg chambers arranged on thin layer of solidified glycerin jelly. Yellow arrowhead indicates an individual egg chamber. (D) A second thin layer of melted glycerin jelly covers the egg chamber columns to embed them. Yellow dotted line indicates where cuts should be made after O/N incubation at 4ᵒC. Red arrow indicates the edge of the second layer of glycerin jelly. Red numbers indicate the order of cutting the egg chamber columns (horizontal top and bottom cuts are not shown). Anterior is to the left. Please click here to view a larger version of this figure. Figure 2. Imaging of the anterior epithelium of an early stage 8 egg chamber. (A) Lateral view of a stage 8 slow border cells (slbo) gene reporter egg chamber (genotype: slbo-Gal4, UAS-mCD8-GFP)19,20, stained with DAPI and primary antibodies as indicated or for slbo>GFP. Armadillo (ARM) is the fly homolog of β-catenin. Anterior (A) is to the left, posterior (P) to the right. (B-B”) End-on views of an egg chamber. Three dimensional reconstruction of Z-stack images of a stage 8 slbo-gene reporter egg chamber mounted upright, stained with primary antibodies as indicated. Magenta asterisks indicate polar cells. DAPI marks the nuclei. (B’) slbo>GFP is expressed only in the presumptive border cells (SLBO). E-cadherin (E-CAD) is an adhesion molecule localized to the membrane and enriched in border cells. (B’’) Eyes Absent (EYA) is found evenly expressed in the nuclei of all follicle cells except polar cells. (C) Standard lateral view of a slbo-reporter stage 8 egg chamber stained with DAPI (blue) and antibodies against GFP (SLBO, green), ARM (red), and FAS3 (white). Inset shows the axes: the X-axis is down (green arrow), Y-axis is towards the left (red arrow), and the Z-axis is towards the viewer (blue). (D) For comparison to the new technique, this panel shows an end on-view created by a three-dimensional reconstruction, processed with Volocity software, using a Z-stack of lateral images of the egg chamber shown in C. Inset shows the turned axes: the X-axis is down (green arrow), Z-axis is now towards the left (blue arrow), and the Y-axis is towards the viewer (red). Individual cells are blurred due to low resolution in the Z-axis; thus, the new approach shown in B represents a significant imaging improvement. Please click here to view a larger version of this figure. Figure 3. Comparing protein expression in lateral and anterior domains of the follicular epithelium of a stage 8 egg chamber. (A) Reconstruction of a lateral view of a stage 8 egg chamber of visgun (VSG)-GFP reporter21-23, stained for antibodies directed against GFP or ARM (white). DAPI marks the nuclei in blue, and large nurse cell nuclei are apparent. VSG localizes to the ring canals of follicle cells (green). (B-B’) End-on views of an egg chamber.Three-dimensional reconstruction of a Z-stack of images of a stage 8 VSG-GFP reporter egg chamber, stained with primary antibodies as indicated. SLBO protein (red) is detected in both polar and border cell nuclei. 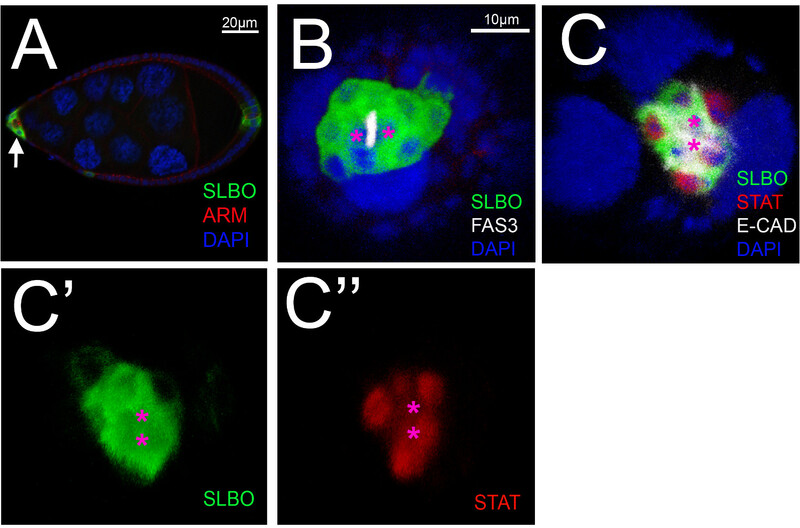 ARM marks follicle cell membranes and is enriched in border cells; DAPI labels nuclei. Please click here to view a larger version of this figure. Figure 4. Imaging of early stage 9 egg chambers. (A) Lateral view of an early stage 9 slbo-reporter egg chamber. The border cells (green) have clustered within the anterior epithelium (white arrow). B-C) End-on views of the egg chambers. Three dimensional reconstruction of a Z-stack of images from an early stage 9 slbo-gene reporter egg chamber, stained using primary antibodies directed against the proteins as indicated or GFP. (B) slbo>GFP is expressed in the border cells (green), while Fasciclin 3 (FAS3, white) localizes highly to the membrane between the two polar cells; DAPI marks the nuclei (blue). Magenta asterisks indicate polar cells. (C) Both nuclear (activated) STAT and slbo>GFP expression are found only in the border cells, while E-cadherin (E-CAD) marks the membranes of follicle cells, and DAPI indicates the nuclei. Magenta asterisks indicate polar cells. Staining results are shown individually for slbo>GFP (C’) and STAT (C’’). Please click here to view a larger version of this figure. Here we describe a method to mount and image small, developing egg chambers from a end-on perspective. Common techniques for imaging egg chambers are optimized for lateral views and primarily allow precise visualization of medio-lateral follicle cells when stained with fluorescent antibodies. The use of Z-stacks or 3-D reconstructions aids in viewing multiple focal planes, but is still inadequate for sub-cellular resolution of the poles of elliptical egg chambers (Figure 2D). While this can be overcome partially with the newest microscopy techniques such as super-resolution imaging, these methods are expensive and not always available. We have adapted upright imaging protocols for Drosophila embryos24,25 to be used for the much smaller egg chambers. There are several key modifications in the method to account for the much smaller size of egg chambers compared to embryos. A key component of the described technique is the physical separation of individual chambers, which is not required of embryos. Another change is the use of a second glycerin jelly slide during mounting (4.4). The size of the egg chambers and their attachment through stalk cells to other egg chambers requires manipulation with the needle and leads to destruction of glycerin jelly. Therefore, egg chambers must be transferred with a needle to a new glycerin jelly slide for mounting (4.5). Upright imaging allows for visualization of the areas blurred by lateral or horizontal views, revealing new information about the tissue organization during egg development. This led to new insights on the patterning events, and we propose that this method could be used to explore additional aspects of oogenesis. We have determined several critical steps in successful upright mounting. We found that is it necessary to remove ovariole chains completely from the sheath during dissection, and desired egg chambers must be cut from the ovariole chain. Failure to free egg chambers from the ovariole makes it difficult to pick up the correct stage egg chamber (step 4.3). We recommend working with small amounts of glycerin jelly at a time by aliquoting it into tubes. Do not heat glycerin jelly more than twice because repeated heating changes its consistency and prevents it from solidifying properly (3.1). Use filter tips to prevent aspirating jelly into pipettors. Allow glycerin jelly to solidify on microscope slide for at least 8 hr at 4 °C. Shortening this step makes mounting the egg chambers difficult (3.6). It is important to make sure to absorb all PBS-glycerol from mounted egg chambers (4.6). If too much liquid is present, it prevents the top layer of glycerin jelly from adhering to the bottom. In this case, egg chambers may float and change position. For best imaging results, glycerin jelly blocks must be cut as close to the anterior side of egg chambers as physically possible (5.4). Too much glycerin jelly on this side decreases image quality due to the increased distance between the specimen and the coverslip. There are some caveats of mounting samples in glycerin jelly. For one, it increases the distance between the sample and the objective. This distance at high magnification, especially while using an oil objective, can create difficulty focusing on the specimen, which can result in poor image quality. Given this, it is very important to carve out the glycerin jelly blocks very close to the egg chambers. Although the glycerin jelly is optically clear, it does defract some light. Another limitation is that antibody signal may be reduced due to a combination of working distance of the objective and the thickness of glycerin jelly. An increase to the concentration of both primary and/or secondary antibodies can sometimes aid in reducing this problem. Although it varies by antibody, we typically acquired better images by using double the concentration of secondary antibody in upright imaging compared to the amount used in standard lateral imaging. We know of no alternatives to glycerin jelly for mounting egg chambers upright. Other materials such as agarose and polyacrylamide were tried but all defracted light more severely, causing a loss of clarity while imaging. Thus, this mounting technique is the best that is currently available for use with standard microscopy. While we focused on the stages of border cell specification and initiation of motility, egg chambers of different stages could be used in this protocol with only a few minor adjustments. Most importantly, the gauge of the needle can be changed to manipulate egg chambers of different sizes and developmental stages. For stages 7-10, a 30 G needle works well because the egg chambers fit easily in the bevel. For earlier stage egg chambers a larger gauge needle (smaller bevel) should be used and similarly a smaller gauge (larger bevel) should be used for later staged egg chambers. Anything at an older developmental stage would be too large for this gauge (4.3). Also any side of the egg chamber can be imaged using this technique by arranging the glycerin jelly block of egg chambers with the area of interest towards the objective. Mounting small samples supported in glycerin jelly has the potential to be useful in multiple contexts. This strategy could be used to visualize different types of small, fixed tissues from other organisms, especially when it would be insufficient to examine the samples from just one perspective. Once this technique is mastered, it can be used to view egg chambers at any desired angle, depending on how the egg chambers are positioned in the jelly. This method allows for unique views creating a much better three-dimensional understanding of cellular organization. Upright imaging of egg chambers in conjunction with immunofluorescent antibody staining allows for the precise detection of proteins and cell-cell contacts that would not be possible under standard mounting conditions. We plan to use this method in mapping the cell-cell interactions that permit the coalescence and detachment of the border cell cluster from the epithelium. At this time, the upright imaging technique cannot be used with live samples, but we are also working to overcome this obstacle. We anticipate this method will also be applicable to study of other aspects of Drosophila oogenesis, or could be adapted to image other small tissues at new angles . We appreciate assistance from members of the fly community, particularly Dr. Denise Montell, Dr. Lynn Cooley, and Dr. Pernille Rorth, for reagents. We thank Flybase, the Bloomington Drosophila Stock Center, and Developmental Studies Hybridoma Bank for information and providing fly stocks and antibodies, respectively. LM is supported by the Department of Education Grant, Graduate Assistance in the Areas of National Need (GAANN) training fellowship (P200A120017) and by a NIGMS Initiative for Maximizing Student Development Grant (2 R25-GM55036). A portion of the microscopy work was supported by NSF MRI grant DBI-0722569 and the Keith R. Porter Core Imaging Facility. Research was supported in part by a NSF CAREER Award (1054422) and a Basil O’Connor Starter Scholar Award from the March of Dimes, both awarded to MSG. 0.1 M Potassium phosphate Buffer (KPO4 Buffer) Add 3.1 g of NaH2PO4•H2O and 10.9 g of Na2HPO4 (anhydrous) to distilled H2O to make a volume of 1 L. The pH of the final solution will be 7.4. This buffer can be stored for up to 1 month at 4°C. Hudson, A. M., Cooley, L. Methods for studying oogenesis. Methods. 68, (1), 207-217 (2014). Bastock, R., St Johnston, D. Drosophila oogenesis. Curr Biol. 18, (23), R1082-R1087 (2008). Wu, X., Tanwar, P. S., Raftery, L. A. Drosophila follicle cells: morphogenesis in an eggshell. Semin Cell Dev Biol. 19, (3), 271-282 (2008). 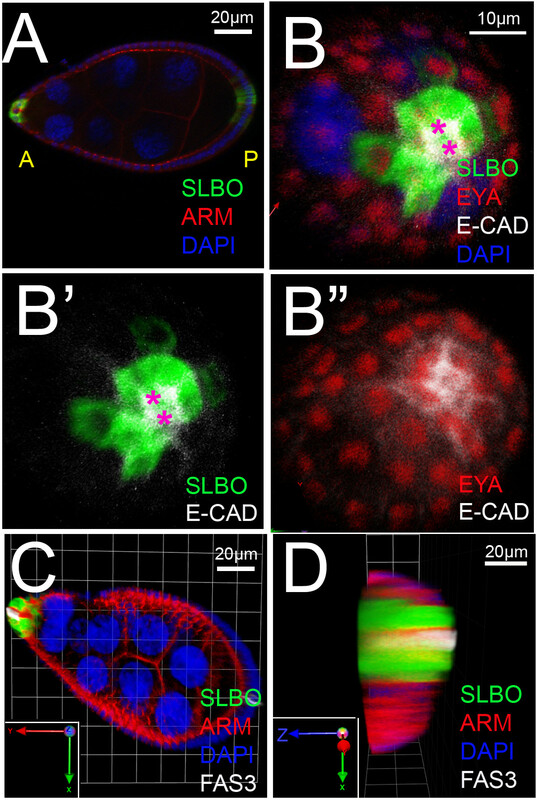 Bilder, D., Haigo, S. L. Expanding the morphogenetic repertoire: perspectives from the Drosophila egg. Dev Cell. 22, (1), 12-23 (2012). Montell, D. J., Yoon, W. H., Starz-Gaiano, M. Group choreography: mechanisms orchestrating the collective movement of border cells. Nat Rev Mol Cell Biol. 13, (10), 631-645 (2012). Spradling, A. C., Bate, M., Marinez-Arias, A. Developmental genetics of oogenesis. The Development of Drosophila melanogaster. Cold Spring Harbor Laboratory Press. Cold Spring Harbor, NY. 1-70 (1993). Montell, D. J. Border-cell migration: the race is on. Nat Rev Mol Cell Biol. 4, (1), 13-24 (2003). Silver, D., Geisbrecht, E., Montell, D. Requirement for JAK/STAT signaling throughout border cell migration in Drosophila. Development. 132, (15), 3483-3492 (2005). Ghiglione, C., et al. The Drosophila cytokine receptor Domeless controls border cell migration and epithelial polarization during oogenesis. Development. 129, (23), 5437-5447 (2002). Denef, N., Schüpbach, T. Patterning: JAK-STAT signalling in the Drosophila follicular epithelium. Curr Biol. 13, (10), R388-R390 (2003). Beccari, S., Teixeira, L., Rørth, P. The JAK/STAT pathway is required for border cell migration during Drosophila oogenesis. Mech Dev. 111, (1-2), 115-123 (2002). Montell, D., Rorth, P., Spradling, A. slow border cells, a locus required for a developmentally regulated cell migration during oogenesis, encodes Drosophila C/EBP. Cell. 71, (1), 51-62 (1992). Xi, R., McGregor, J., Harrison, D. A gradient of JAK pathway activity patterns the anterior-posterior axis of the follicular epithelium. Dev Cell. 4, (2), 167-177 (2003). Toomre, D., Bewersdorf, J. A new wave of cellular imaging. Annu Rev Cell Dev Biol. 26, 285-314 (2010). McDonald, J., Pinheiro, E., Kadlec, L., Schupbach, T., Montell, D. Multiple EGFR ligands participate in guiding migrating border cells. Dev Biol. 296, (1), 94-103 (2006). Van de Bor, V., Zimniak, G., Cérézo, D., Schaub, S., Noselli, S. Asymmetric localisation of cytokine mRNA is essential for JAK/STAT activation during cell invasiveness. Development. 138, (7), 1383-1393 (2011). Hayashi, Y., et al. Glypicans regulate JAK/STAT signaling and distribution of the Unpaired morphogen. Development. 139, (22), 4162-4171 (2012). Airoldi, S. J., McLean, P. F., Shimada, Y., Cooley, L. Intercellular protein movement in syncytial Drosophila follicle cells. J Cell Sci. 124, (Pt 23), 4077-4086 (2011). Rørth, P., et al. Systematic gain-of-function genetics in Drosophila). Development. 125, (6), 1049-1057 (1998). Lee, T., Lee, A., Luo, L. Development of the Drosophila mushroom bodies: sequential generation of three distinct types of neurons from a neuroblast. Development. 126, (18), 4065-4076 (1999). Shimada, Y., Burn, K. M., Niwa, R., Cooley, L. Reversible response of protein localization and microtubule organization to nutrient stress during Drosophila early oogenesis. Dev Biol. 355, (2), 250-262 (2011). Quiñones-Coello, A. T., et al. Exploring strategies for protein trapping in Drosophila. Genetics. 175, (3), 1089-1104 (2007). Buszczak, M., et al. The carnegie protein trap library: a versatile tool for Drosophila developmental studies. Genetics. 175, (3), 1505-1531 (2007). Belu, M., et al. Upright imaging of Drosophila embryos. J Vis Exp. (43), (2010). Witzberger, M. M., Fitzpatrick, J. A., Crowley, J. C., Minden, J. S. End-on imaging: a new perspective on dorsoventral development in Drosophila embryos. Dev Dyn. 237, (11), 3252-3259 (2008).